Art Exhibition Opening: BC Senior Show – March 29, 5:30 p.m.
Exhibiting in a variety of mediums and displaying four years of artistic growth guided by our phenomenal faculty, Brevard College senior Art majors will show and discuss their works starting at 5:30 p.m. in the Sims Art Center on the Brevard College campus. Gallery talks will begin at 6:00 p.m. This event is free and open to the public. 9th Annual Fine Arts Gala – March 30, 6:00 p.m.
A yearly celebration of Brevard College Fine Arts students and programs! “Funds raised at this wonderful event go toward expanding experiential educational opportunities that transform the lives of our students,” states Lynne Joyce, Gala co-chair. 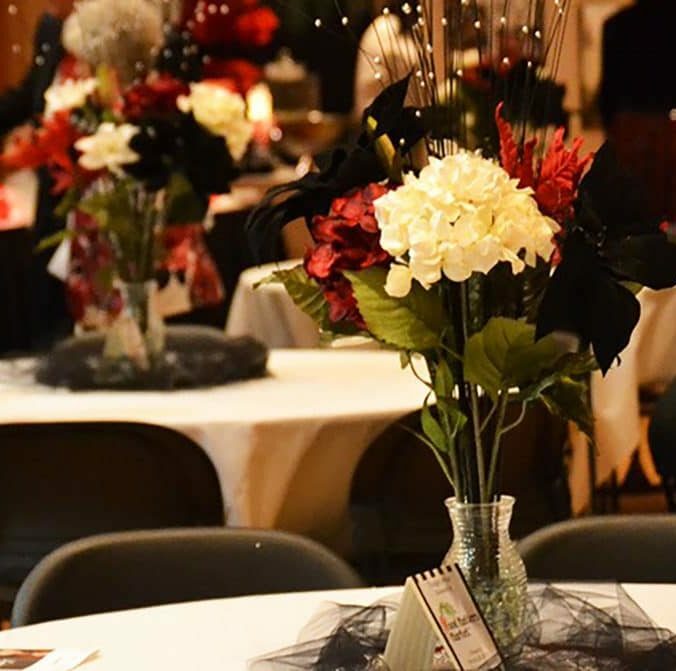 Patrons have the opportunity to participate in live and silent auctions, fund a special student experience, enjoy gourmet food and entertainment. Black tie optional. Last year’s auction made possible the purchase of a 3D printer, costume racks and sewing machines for the Theatre program, woodworking equipment and a pocket cinema camera for the Art program, and many new concert percussion instruments for the Music program. It also brought in guest artists such as Disney and Nickelodeon animator Jim Jinkins and Shakespeare director David Hammond and supported our students’ travel to programs like Open Jar, the Tri-State Sculpture Conference, and the Southeastern Theatre Conference. Sponsorship and underwriting opportunities are filling up, with a few spots still available. If you are interested in a sponsorship, please contact Christie Cauble at 828.884.8250. Tickets to the Gala are $100 each (tax-deductible up to $50) for the general public. Tickets can be purchased online at www.brevardcollege.eventbrite.com or by calling 828.884.8218. You can also stop by the Office Alumni Affairs and Development located at 18 Alumni Drive on the Brevard College Campus for more information or to purchase tickets. Calidore String Quartet – March 31, 3:00 p.m.
Brevard College presents The Calidore String Quartet at the Porter Center for Performing Arts. The Calidore String Quartet’s “deep reserves of virtuosity and irrepressible dramatic instinct” (New York Times) and “balance of intellect and expression” (Los Angeles Times) have won them accolades around the globe and firmly established them as one of the finest chamber music ensembles performing today. The Calidore String Quartet – violinists Jeffrey Myers and Ryan Meehan, violist Jeremy Berry, and cellist Estelle Choi – has enjoyed an impressive number of accolades, including a 2018 Avery Fisher Career Grant, and the 2017 Lincoln Center Emerging Artist Award. The Calidore made international headlines as winner of the $100,000 Grand-Prize of the 2016 M-Prize International Chamber Music Competition, the largest prize for chamber music in the world. The quartet was also the first North American ensemble to win the Borletti-Buitoni Trust Fellowship and was named BBC Radio 3 New Generation Artists. The Calidore has also won grand prizes in all the major U.S. chamber music competitions (including the Fischoff, Coleman, and Chesapeake) and top prizes at the ARD Munich International String Quartet Competition and Hamburg International Chamber Music Competition. They have been performers in residence with the Chamber Music Society of Lincoln Center’s Bowers Program (formerly CMS Two) program since 2016. The Calidore String Quartet regularly performs in prestigious venues throughout the world, including Lincoln Center, Carnegie Hall, Kennedy Center, Wigmore Hall, Berlin Konzerthaus, Brussels BOZAR, Cologne Philharmonie, Seoul’s Kumho Arts Hall and at many significant festivals, including the BBC Proms, Verbier, Ravinia, Mostly Mozart, Music@Menlo, and Festspiele Mecklenburg-Vorpommern. Tickets are on sale now! General admission: $20; free to students with ID. Tickets may be purchased online at www.brevardcollege.eventbrite.com or an hour before the concert at the Porter Center Box Office. Brevard College is consistently recognized as one of the best liberal arts colleges. The College’s focus on experiential learning, small class sizes, and location the mountains of Western North Carolina near Asheville make Brevard a top choice college for students around the world.